As luck would have it, today is Saint Patrick’s Day! Though I live in the US—to honor my Irish roots—I always look forward to a small salute to the Emerald Isle! Years past, I’ve opened the Guinness and made decadent Guinness Brownies, hearty Guinness Beef Stew, and when the Guinness was no longer, a nice twist on Irish Coffee, to round-out the occasion. This year, I wanted to create something different, yet still paying homage to Saint Paddy’s. With some leftover mashed potatoes and a dream, I decided this time to create a version of traditional Irish Boxty, potato pancake—potayto, potahto. Boxty. Well, that sounds cardboard-like, but it is actually quite the opposite! This dish is really just a traditional Irish cake of potatoes, and literally tranlates to “poor-house bread.” It is usually made with leftover mashed potatoes, flour and milk. Easy to make, easy to eat, and served in a variety of ways! Really, I look at it as the Irish man’s tortilla, flat bread, pancake, you name it. I decided to take a little Southern spin on the cake of potato goodness, and opt for a thicker, savory ‘pancake’ using buttermilk, onion, garlic and mashed & grated taters. Result? A tasty Saint Patrick’s Day inspired treat the whole family will like. We’ll serve them up pot-of-golden brown, topped with sour cream & scallions, and dinnervine boxty history has been made. 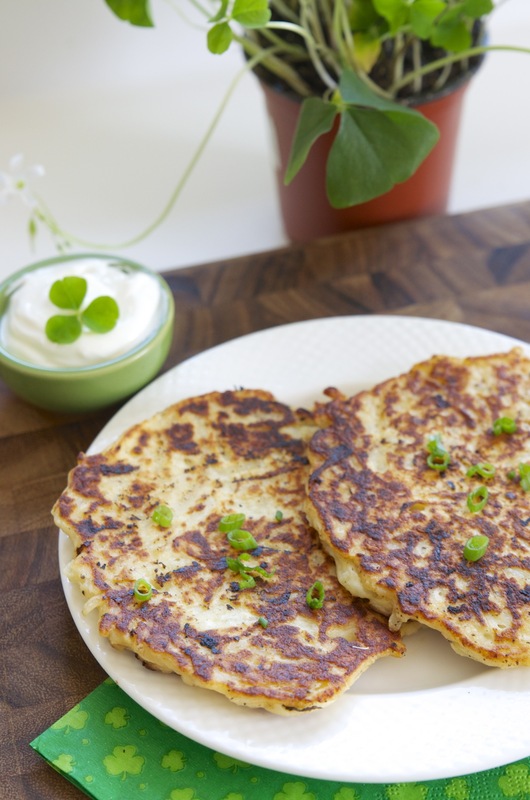 Irish style pancakes, or boxty, are a delicious alternative to the average pancake! Golden brown, savory and simple! Serve up anytime of day with some sour cream and green onion. (If you don't have leftover mashed potatoes, make by: Peeling 2 medium russets & dicing, boiling in salted water until very soft, draining & cooling, then mashing by hand with ¼ cup buttermilk and salt & pepper). Grate 1.5 cups of peeled russet potato using a boxed grater (or you can buy a bag of pre-shredded potatoes) and squeeze out any residual moisture by wringing shredded potatoes wrapped in cheesecloth. In a large flat skillet, cook a few pieces of bacon (for the grease) and set bacon aside for another use, reserving grease in pan. In a mixing bowl, combine mashed potatoes (room temp or cooled), grated potato, salt, pepper, flour, and baking powder, then adding buttermilk until mix is wet (will be lumpy) like a batter. Return skillet with bacon grease to stove to preheat, and add ~1/4 cup of batter for each pancake, (slightly spreading with spatula, to form a thin circle), cook a few at a time, depending on skillet size. Cook cakes on each side ~4 mins, until each side is golden brown & cake is cooked through. If making multiple batches, place finished cakes to warm on a baking sheet into a 250 degree oven, until all are done. Serve cakes warm with side of sour cream & chopped green onion on top! This is a great recipe for using leftover mashed potatoes! You can use other varieties of potato, but I prefer regular russet baking potatoes. If I do not have leftover mashed taters, I make a simpler version for this recipe, omitting butter and just using some of the buttermilk and S&P. These can be made ahead. You can buy pre-shredded potatoes as well, which speeds this up. Make cakes larger as desired, but the cooking time will increase, I prefer them smaller for more crispy surface area.